See collection: Jacques Callot: The Thirty Yaars War "Miseries of War"
Between 1618 and 1648, Europe was on fire. From France to the Baltic Sea, from Sweden to Spain, marauding troops from all factions of the conflict devastated vast territorres. Cities and marketplaces, castles and huts, even fields of grain ripe for harvesting were ravaged by war. Until the Thirty Years' War, Europe had not known destruction on this scale. During these years, the population diminished by more than a third. Entire regions were decimated. Barbaric incursions were followed by plague epidemics, which always found fertile soil in times of war. The German territories bore a considerable brunt of the disaster at the hands of Swedish mercenaries. When they wanted to break the resistance of a territory, the Swedish armies ruthlessly attacked one village after another, leaving nothing behind but scorched earth. "Almost the entire village was reduced to rubble, burnt by the enemy on the 24th", noted the abbot of Andechs Monastery in Bavaria in June 1632. "No one could save anything. All supplication and lamenting was fruitless." The pious man was particularly horrified "at the unusual cruelty shown everywhere by the enemy to the elderly, the frail and the simple. In Erling twelve people of the above categories have fallen victim to their slaughter. After tormenting and torturing them, they were killed. The atrocity committed at Traubmg against an old man and woman may serve as an example, where they heinously raped and mutilated her and gouged out the man's eyes before throwing both into the fire." In those dark days children in the streets sang gloomy songs: "The Swedes have come, have taken everything, broken windows, carried off the lead, made bullets of it and shot the peasants." In autumn 1632, the suffering peoples of the German territories glimpsed a ray of hope. A decisive battle against the invaders seemed to be in the offing. 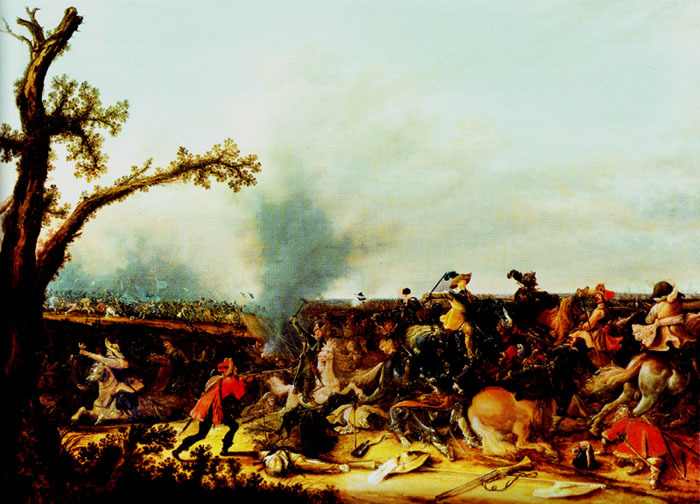 On 16 November the German and Swedish armies clashed at Lutzen, a town south-west of Leipzig. The Swedish King, Gustav II Adolf, fell in battle. The short-sighted monarch wandered into the lines of the Holy Roman Empire where "soon his left arm was shot to bits above the elbow" before he was felled by two blows of a sword and died in a hail of musket balls. Despite the demise of their king, the Swedes won the battle. The conflict was to drag on for sixteen more weary years. The Peace of Westphalia finally put an end to the war in 1648, the date that marks the end of an age of religious conflict. A new era of European history dawned in which the welfare of principalities and kingdoms no longer depended on the religious affiliation of their subjects.